Jesus is baptized by His relative John. This lesson includes a one-page slider for review. Scripture for lesson is found in Mathew 3:13-17 (also Mark 1:4-12; Luke 3:2-23; John 1:28-33. 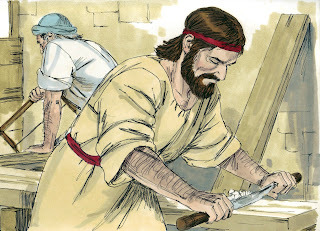 Jesus grew up working with His earthly father, Joseph, being a carpenter. They lived in Nazareth, a small town in Galilee. When He was 30 years old, He left home and went to see his John His relative. Remember that we studied about the birth of John. 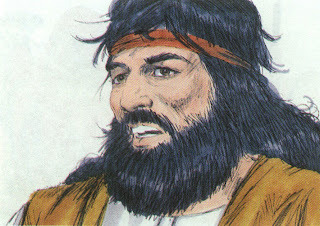 His father is Zacharias and his mother is Elizabeth. Zacharias didn’t really believe the angel when he said that they would have a baby. Remember that they were older. 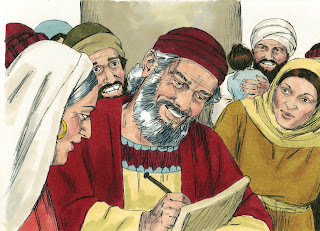 So Zacharias couldn’t talk until the baby was born and he wrote that “His name is John” for the people to see. Jesus went to meet John at the Jordan River. He wanted to be baptized. And Jesus wanted John to baptize Him. 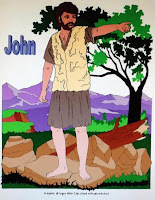 About John: Mathew 3:1-11 John and Jesus were related. He wore clothes made from Camel’s hair with a leather belt around his waist. John ate locusts and wild honey. People came to him from all Judea. 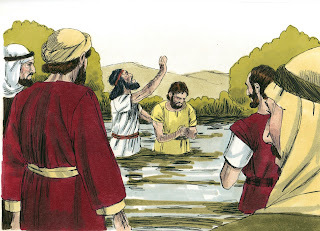 John baptized the people in the Jordan River with water and said that the One coming was mightier than him. (Matthew 3:11) John was preparing the way for Jesus to come. He did what God wanted and taught people about Jesus. He didn’t worry if it upset people because he taught them about Jesus. He wasn’t ashamed to live for Jesus. 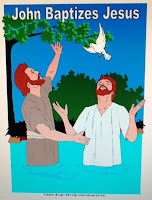 Jesus told John “Permit it to be so now, for thus it is fitting for us to fulfill all righteousness.” Then John baptized Him. Jesus didn’t need to be baptized since He had never sinned. But Jesus was baptized to show us an example of what we need to do. 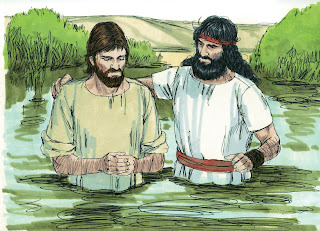 Jesus’ baptism also show us how to be baptized. Baptism is for people that know right from wrong, believe that Jesus is the Son of God and they want to go to Heaven. When you repent you have a change of heart, and change how you live your life. Baptism washes away sin and then if you live the way God wants, you will go to Heaven. 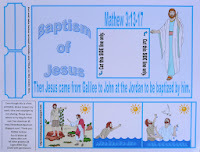 Today's extra printable is the Baptism of Jesus slider. 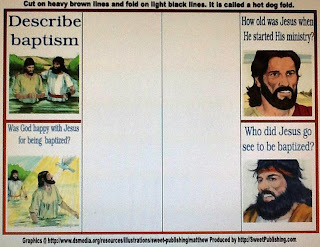 As you are telling the Bible lesson, the kids can slide from picture to the next. The left is what it looks like when you print it and the above right is the finished slider. You use a craft knife to make the slits for the picture strip to slide in. You can print it here. These are available to print in color or in black and white to use as a picture to color. **Jesus’ baptism is the start of His ministry. 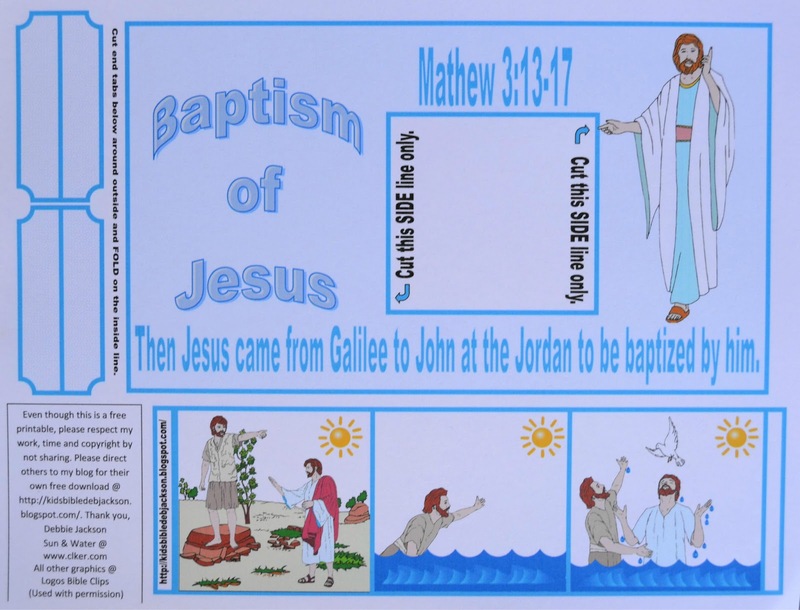 These are the baptism posters I use when I teach the book of Acts. This is the lapbook worksheet for today's lesson. 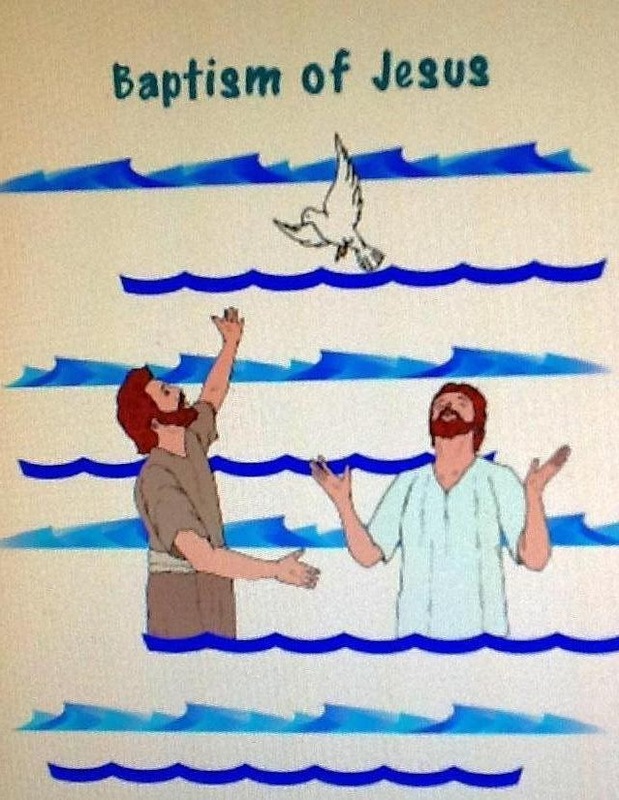 The page has the water and, the students will cut and glue Jesus, John and the dove to the page. You can print it here. Thank you so much for creating this!! I just stumbled across your blog and I love your work! Thank you so much for sharing! Do you by chance have the Jesus and John the baptist and dove cut out page available as a coloring sheet? Sorry, I just saw your comment. You can download one @ https://drive.google.com/file/d/0B3uNEVAAKowpcFpnczNwcW1MWVE/view?usp=sharing Thanks for stopping by. Love the craft activities.....my class loved them!